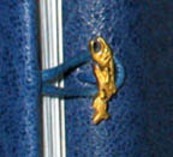 Close-up view of the bronze salmon clasp, custom made by John Hughes. This book received a Distinguished Book Award 2007 from the Miniature Book Society, Inc.
Why do UN forces wear blue helmets? Why do we sing the blues? What makes royal blue royal? Why do so many people choose blue as their favourite colour? What is it about blue that we find so agreeable? These are some of the questions that prompted me to investigate the colour blue. My curiosity was piqued shortly after I came to live in the small town of Qualicum Beach, on the east coast of Vancouver Island, British Columbia, Canada.The whole area seems steeped in blue. It has the sea on one side, the mountains behind, and sky like a giant blue shade pulled down to meet them. Some days the scene is violet and indigo, on others it's an intense 'Virgin Mary's cloak' blue, or palest silvery blue. There are shades of blue everywhere, from the purplish blue Arctic Lupines lining the highway to the gray-blue Great Blue Heron, Steller's Jays, blue butterflies, dragonflies, salmon and of course, blueberries. So many blues, I was stimulated to explore the colour, its historical and cultural associations and the meanings or emotions conveyed to us, shaping our perceptions. The text was printed in a Caslon font on a Craftsmen platen press using pale blue Zerkall Ingres mould made paper. The text occupies one side of the book: there are sixty nine pages with a bibliography, and a pochoir frontispiece showing a view of Denman Island from Qualicum Beach. The second part of the book, Blue Gallery, contains a series of illustrations made using the pochoir technique, a form of stencilling. For me, the charm of the technique lies in the vibrancy obtainable using watercolours, and the range of effects from dense solid shades to transparent veils of colour. The stencils are hand cut, at least one for each colour, from original artwork. It is a laborious process, and not surprisingly, ceased to be used as soon as a suitable more automated method could be found to replace it. The pochoir technique was used in Europe mainly in the early twentieth century, although it was known and used by other cultures at various times. In the Art Deco period, particularly in Paris, artists such as Saudé and Erté illustrated up-market fashion magazines and advertising material for haute couturiers. Their distinctive colour palette and decorative subject matter are very attractive and convey perfectly the flavour and extravagance of the times. The illustrations are all of plants and creatures found in the vicinity of Qualicum Beach, on Vancouver Island, although many of them can also be found across North America and in particular along the Pacific Coast. They range in hue from palest azure to inky dark indigo, a symphony of blues. I decided to make Qualicum Blue a dos à dos binding, as the illustrations are complementary to the text, rather than illustrative of it. This type of binding is two books bound as one, each with its own front cover, and sharing a middle board. The book is bound in blue goatskin leather, and the title labels are gold blocked and inlaid into the covers, to give a cushiony effect. The covers are fastened with two salmon-shaped bronze toggles designed and made especially for the book by Canadian designer-jeweller John Hughes. Claire Maziarczyk's handmade pastepaper is used for endpapers, and also covers the slipcase. 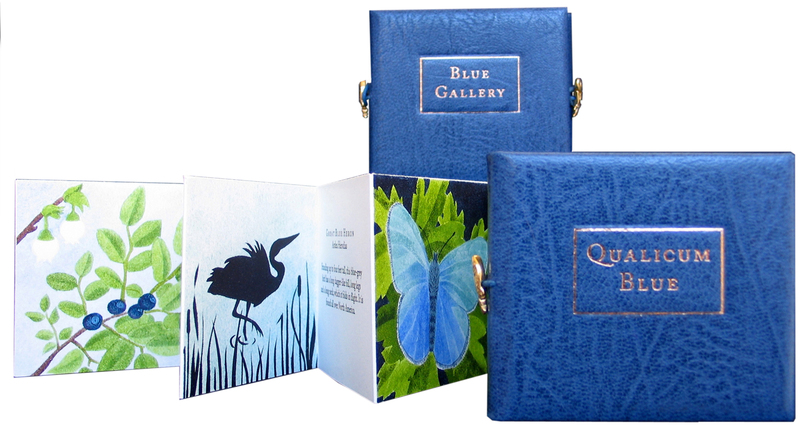 Qualicum Blue was published in May 2007, in a Limited Edition of thirty copies, about three inches wide by two and three quarter inches high, inclusive of slipcase. Each copy is signed and numbered. The text is printed letterpress with photopolymer plates on blue Zerkall Ingres mouldmade paper. There are sixty-nine pages, with pochoir frontispiece, contents page and bibliography. Blue Gallery consists of seven pochoir prints on Zerkall mouldmade paper alternating with pages detailing the name and description of the plant or creature. Bound together, in slipcase. BIBLIOGRAPHY as it appears in the book.